Labyrinth walking in an ancient practice used by many different faiths for spiritual centering, contemplation, and prayer. Entering the serpentine path of a labyrinth, you walk slowly while quieting your mind and focusing on a spiritual question or prayer. A labyrinth is not a maze. It has only one path to the center and back out, which is called unicursal (one line). It has no blind alleys or dead ends as mazes have. The path twists and turns back on itself many times before reaching the center. Once at the center, there is only one way back out. In this way, the labyrinth symbolizes a journey to a predetermined destination (such as a pilgrimage to a holy site), or the journey through life from birth to spiritual awakening to death. Labyrinth images are found in many cultures. The term is of ancient Greek origin and the labyrinth in the palace of Knossos in Crete figures in Greek mythology. It is found in Hindu and Hopi images, among many others. In Christian usage, a labyrinth was constructed in stone in the floor of Chartres cathedral near Paris, around the year 1200 A.D. The faithful could make a pilgrimage journey to the cathedral and complete it by walking the labyrinth as the final symbol of a journey to the Holy Land. It was also used as an act of repentance for sins. The penitent might walk it on their knees. Labyrinths are found in many Gothic cathedrals throughout Europe. Today, there is no set ritual for walking a labyrinth, but there are books and lectures to assist you in performing a labyrinth walk. The basic advice is to enter the labyrinth slowly, calming and clearing your mind. This may be done by repeating a prayer or chant. Open your senses and focus on the process of taking slow and deliberate steps. Bring to mind a prayer or spiritual question to contemplate during the walk to the center. Reaching the center, pause to reflect, pray, and listen for an answer or for deeper revelation. Now begin the return journey. Pray or reflect further. Upon exiting, absorb the experience with continued reflection, prayer, or journaling. 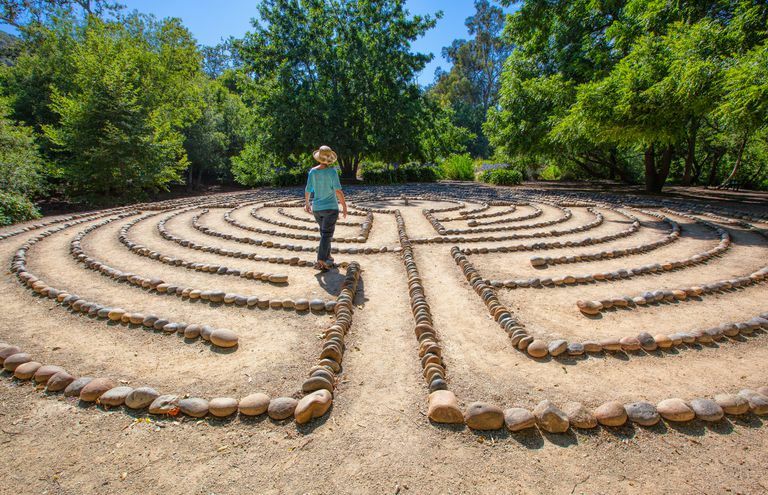 Walking a labyrinth in this way can be surprisingly calming and clarifying for your thoughts. Even if you don't have a spiritual side, the slow, intentional walking in a quiet place on a set path allows for a level of focus that can be difficult to find in a busy life. The path of the traditional Chartres design weaves back and forth, but also takes the walker seemingly close to the destination at the center, then sends you off on many more zig-zags away before you once again appear to be nearing the center. This can bring to mind expectations about goals and how unexpected tangents can appear in life. If there are others walking the labyrinth, you'll at times approach them on your path and then be sent farther away. This can bring to mind how people enter and leave your life. If the labyrinth is set up indoors, it may be in a darkened room with candlelight to set the calming and reflective mood. Outdoors, a labyrinth is often in a sheltered area surrounded by trees to shield the walkers from extraneous sights and sounds. Labyrinths are most often found on church grounds and spiritual retreat centers. The World-Wide Labyrinth Locator allows you to search by country, city, state, and zip code. The listings include descriptions, directions, open hours, and photos. You can create your own temporary labyrinth by using a basic labyrinth pattern and laying out stones, sticks, or drawing it in the sand. More permanent labyrinths are created with garden paths, plantings, and rock work. The Labyrinth Society lists upcoming labyrinth seminars, group walks and lectures throughout the US. There may be a local labyrinth club in your area. The spiritual season of Lent, preceding Easter, is often a time when churches host labyrinth walks and lectures. Search for labyrinths in your area and see if any of them are hosting such events. The book "Walking a Sacred Path," by Dr. Lauren Artress can help you understand more about labyrinths. The author lectures widely on labyrinths and labyrinth walking. She explores the history and significance of the image of the labyrinth and explains how you can use it to lead yourself to new sources of wisdom, change, and renewal.